Tinnitus is a condition where one hears or perceives a sound without any external sound stimulus, it is commonly experienced as a high pitched ringing or buzzing. As tinnitus is experienced as a phantom sound it was initially thought to arise from the ear, however, recent research has shown that perception and generation are often linked to specific brain regions. A recent publication in the journal Ear and Hearing suggested that the number of people newly diagnosed with tinnitus had increased between 2002 and 2011 , making the search for an effective therapy ever more important. However, the fundamental pathophysiology of the condition is still not fully understood and this has impeded the development of effective treatments. Brain scans through methods such as fMRI (Functional Magnetic Resonance Imaging) have implicated specific brain regions and neural circuitries to be involved in the perception and generation of tinnitus, leading to opportunities for novel therapies targeting these areas. Among these regions are the parahippocampal gyrus (PHG) which has been consistently identified in neuroimaging studies of tinnitus [9-13]. The amygdala and hippocampus (limbic areas of the brain) are thought to contribute to the persistent perception of tinnitus through a specific circuitry with the PHG [14,17]; supporting the theory of a ‘limbic distress network’ which is also consistent with Prof Jastreboff’s model of tinnitus [14–16]. This new understanding of Tinnitus generation and perception has allowed for a new therapy to emerge which can target these specific areas of the brain to reduce overactivity and break the cycle of the limbic distress network. This therapy utilises the vagus nerve, which passes via the outer ear to the NTS and on to these brain regions. Using a small handheld neurostimulation device and electrode clipped to the outer ear it is possible to target and directly modulate the brain via the vagus nerve. This technological advance has enabled greater research to be conducted in those suffering with Tinnitus, further supporting the development of a novel low risk therapy. The therapy known as vagus nerve stimulation (VNS) previously received FDA clearance based on its established safety and efficacy, for use in individuals with depression and epilepsy and has now been used by hundreds of thousands of people yet historically limited by the need for surgery to deliver. The development of non-invasive VNS (transcutaneous VNS, tVNS) is safer and now much more accessible as it does not require surgery and can be used remotely. 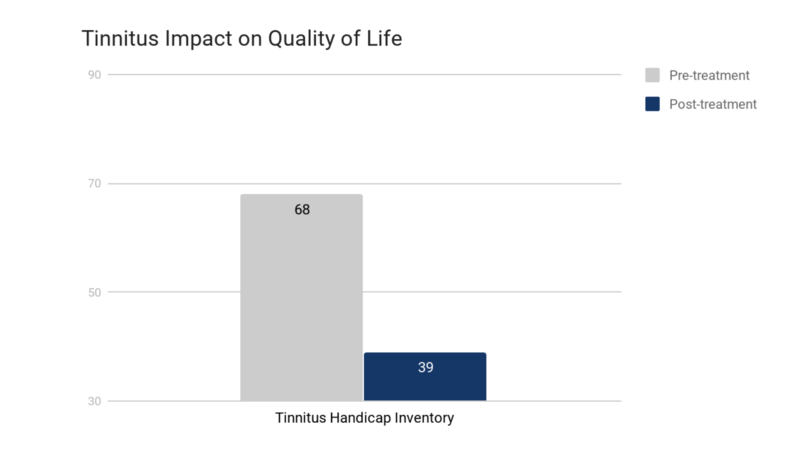 In a recent study , 36 people with chronic tinnitus lasting 3 months or longer were assessed with either active or placebo tVNS treatment. Active treatment used an electrode connected to part of the outer ear which innervates the vagus nerve whereas placebo treatment used a part of the outer ear with no vagal innervation. 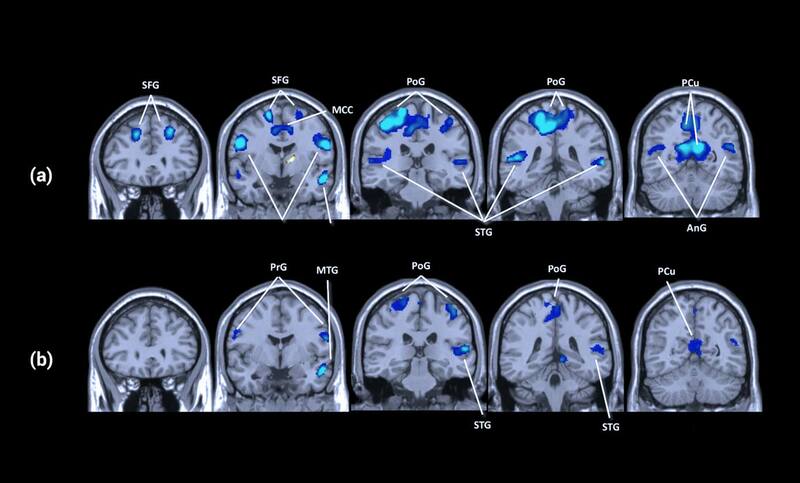 Brain scans were obtained to provide visual interpretations of the tVNS effects. Figure 1: Regions coloured red were activated and while those coloured blue were deactivated by tVNS at the tragus. Legend: tVNS, transcutaneous vagus nerve stimulation; MCC, middle cingulate cortex; Amyg, amygdala; AnG, angular gyrus; CC, corpus callosum; Hip, hippocampus; STG, superior temporal gyrus; PCu, precuneus; PoG/PrG, postcentral/precentral gyrus; TMP, temporal pole. Figure 2: Activations (red) and deactivations (blue) induced by tVNS for normal subjects (a) and tinnitus patients (b) after matching the number of functional volumes (p < 0.05, cluster corrected for multiple comparisons). AnG: angular gyrus; CC: corpus callosum; Hip: hippocampus; MCC/PCC: middle/posterior cingulate cortex; MTG/STG: middle/ superior temporal gyrus; PCu: precuneus; PoG/PrG: postcentral/precentral gyrus; SFG: superior frontal gyrus. These scans revealed that tVNS stimulation activates the locus coeruleus (LC) and nucleus of the solitary tract (NST) in the brainstem which then projects to these other key brain regions. The treatment was found to deactivate the auditory system including the superior temporal gyrus, Heschl's gyrus, planum polare and planum temporale. These observations suggest that tVNS can modulate the dysfunctional auditory cortex and induce selective suppression of tinnitus-related brain regions. In addition, tVNS also induced the deactivation of the limbic system which was implicated in the generation of tinnitus. It was thought that abnormally strengthened signal transductions between the auditory, limbic and attention systems were the main mechanisms behind the worsening of tinnitus. These overactive systems intensified the neural transmission of tinnitus signals within the brain. This new research suggests two main neurological mechanisms contributing to the experience of this phantom sound, auditory-cortex-related tinnitus associated with little or no hearing loss, and parahippocampus-related tinnitus associated with more severe hearing loss . The parahippocampal gyrus (PHG), along with the amygdala and hippocampus, form part of the limbic system that is now thought to be important in contributing to the perception of tinnitus associated with hearing loss. It was proposed that tinnitus could occur when hearing was lost and the brain attempted to fill in such missing information with the phantom sounds, much like amputees experience phantom limb pain without the external pain stimuli . The deactivation of this limbic “distress network” was pivotal to decreasing phantom perception and reduce the severity of tinnitus. VNS has also been found to evoke the secretion of norepinephrine in the LC, which facilitates serotonin secretion in the raphe nuclei [19,20]; where tVNS has also been shown to modulate GABA receptors and increase GABA concentration [21-23]. This further sheds light on the beneficial effects of tVNS in the treatment of tinnitus as several studies have highlighted the importance of serotonin or GABA depletion in the development of tinnitus, as well as indicating the effectiveness of treatments targeting these neurotransmitters [24-29]. This limbic distress network can also be measured by changes in the autonomic nervous system (ANS), where tinnitus is commonly associated with an overactive sympathetic nervous system (SNS) or a reduced parasympathetic nervous system (PNS). 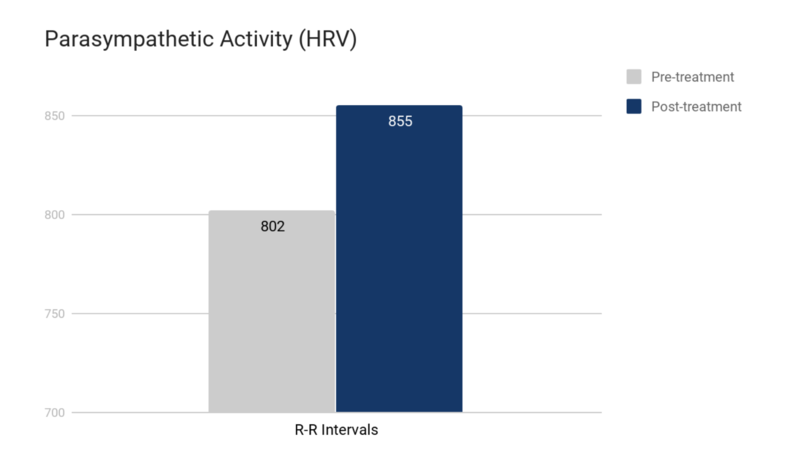 tVNS delivered through the Parasym device was shown to effectively restore balance to the ANS as measured by an increase in heart rate variability (HRV) . This further supports the notion that tVNS can reduce the limbic distress network involved with Tinnitus. Figure 3: The low values in variability of the R-R intervals pre-treatment signified a sympathetic preponderance. tVNS treatment subsequently increased the average R-R variability indicating greater parasympathetic activity and reductions in stress which is associated with the limbic distress network. 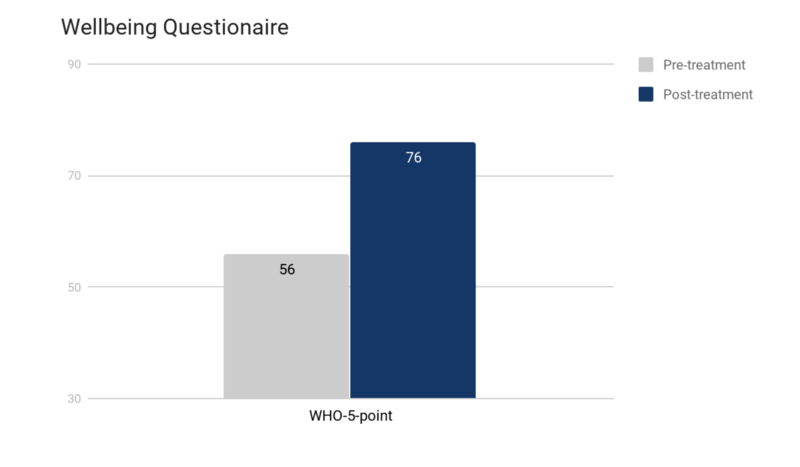 Further tVNS and sound therapy have been shown to directly improve measures of wellbeing (as measured by WHO wellbeing questionnaire) as well as showing a decreases in the impact of Tinnitus on quality of life (as measured by the Tinnitus Handicap Inventory, THI) . This new understanding in the neurological mechanisms of tinnitus and recent clinical data provide evidence that tVNS can be used as an effective treatment for tinnitus by selectively deactivating certain regions associated with tinnitus perception and generation, as well as targeting key neurotransmitters and reducing imbalance in the autonomic nervous system. A recent systematic review published in the journal Brain Stimulation found tVNS to be a safe and well tolerated treatment modality. The analysis included 51 previous studies with a cumulative number of more than 1300 participants receiving tVNS . The main reported side effect was mild irritation at the stimulation site and this typically ceased shortly after stimulation. While there is still much more to be learnt about the process of tinnitus forming and the experience of it over time, this new research provides new opportunity for relief from this debilitating condition. Yakunina, N., Kim, S. S., & Nam, E. C. (2018). 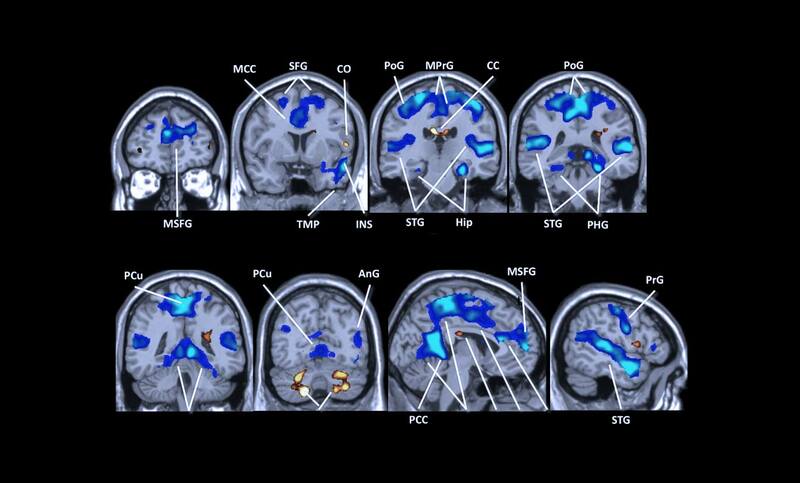 BOLD fMRI effects of transcutaneous vagus nerve stimulation in patients with chronic tinnitus. PloS one, 13(11), e0207281. Ylikoski J, Lehtimäki J, Pirvola U, et al. Non-invasive vagus nerve stimulation reduces sympathetic preponderance in patients with tinnitus. Acta Otolaryngol 2017;137:426–31. Redgrave, J., Day, D., Leung, H., Laud, P. J., Ali, A., Lindert, R., & Majid, A. (2018). Safety and tolerability of Transcutaneous Vagus Nerve stimulation in humans; a systematic review. Brain stimulation, 11(6), 1225-1238. Maudoux A, Lefebvre P, Cabay JE, Demertzi A, Vanhaudenhuyse A, Laureys S, et al. Auditory resting state network connectivity in tinnitus: a functional MRI study. PLoS One. 2012; 7: e36222. Schmidt SA, Akrofi K, Carpenter-Thompson JR, Husain FT. Default mode, dorsal attention and auditory resting state networks exhibit differential functional connectivity in tinnitus and hearing loss. PLoS One. 2013; 8: e76488. Joos K, Vanneste S, De Ridder D. Disentangling depression and distress networks in the tinnitus brain. PLoS One. 2012; 7: e40544. Schecklmann M, Landgrebe M, Poeppl TB, Kreuzer P, Manner P, Marienhagen J, et al. Neural correlates of tinnitus duration and distress: a positron emission tomography study. Hum Brain Mapp. 2013; 34: 233–240. Schlee W, Mueller N, Hartmann T, Keil J, Lorenz I, Weisz N. Mapping cortical hubs in tinnitus. BMC Biol. 2009; 7: 80-7007-7-80. De Ridder D, Elgoyhen AB, Romo R, Langguth B. Phantom percepts: tinnitus and pain as persisting aversive memory networks. Proc Natl Acad Sci USA. 2011; 108: 8075–8080. Chen YC, Xia W, Chen H, Feng Y, Xu JJ, Gu JP, et al. Tinnitus distress is linked to enhanced resting state functional connectivity from the limbic system to the auditory cortex. Hum Brain Mapp. 2017; 38:2384–2397. Yang Y, Wang JZ. From Structure to Behavior in Basolateral Amygdala-Hippocampus Circuits. Front Neural Circuits. 2017; 11: 86. Vanneste S, De Ridder D. Deafferentation-based pathophysiological differences in phantom sound: Tinnitus with and without hearing loss. Neuroimage. 2016; 129: 80–94. Dorr AE, Debonnel G. Effect of vagus nerve stimulation on serotonergic and noradrenergic transmission. J Pharmacol Exp Ther. 2006; 318: 890–898. Furmaga H, Shah A, Frazer A. Serotonergic and noradrenergic pathways are required for the anxiolytic-like and antidepressant-like behavioral effects of repeated vagal nerve stimulation in rats. Biol Psychiatry. 2011; 70: 937–945. Neese SL, Sherill LK, Tan AA, Roosevelt RW, Browning RA, Smith DC, et al. Vagus nerve stimulation may protect GABAergic neurons following traumatic brain injury in rats: An immunocytochemical study. Brain Res. 2007; 1128: 157–163. Beste C, Steenbergen L, Sellaro R, Grigoriadou S, Zhang R, Chmielewski W, et al. Effects of Concomitant Stimulation of the GABAergic and Norepinephrine System on Inhibitory Control—A Study Using Transcutaneous Vagus Nerve Stimulation. Brain Stimul. 2016; 9: 811–818. Sedley W, Parikh J, Edden RA, Tait V, Blamire A, Griffiths TD. Human Auditory Cortex Neurochemistry Reflects the Presence and Severity of Tinnitus. J Neurosci. 2015; 35: 14822–14828. Brozoski T, Odintsov B, Bauer C. Gamma-aminobutyric acid and glutamic acid levels in the auditory pathway of rats with chronic tinnitus: a direct determination using high resolution point-resolved proton magnetic resonance spectroscopy (H-MRS). Front Syst Neurosci. 2012; 6: 9. Han SS, Nam EC, Won JY, Lee KU, Chun W, Choi HK, et al. Clonazepam quiets tinnitus: a randomised crossover study with Ginkgo biloba. J Neurol Neurosurg Psychiatry. 2012; 83: 821–827. Zheng Y, Vagal S, McNamara E, Darlington CL, Smith PF. A dose-response analysis of the effects of Lbaclofen on chronic tinnitus caused by acoustic trauma in rats. Neuropharmacology. 2012; 62: 940–946. Eggermont JJ. Pathophysiology of tinnitus. Prog Brain Res. 2007; 166: 19–35.